I must say that I'm pretty pumped to start seeing and hearing football talk around these parts! Fall is my absolute favorite and with it brings f-o-o-t-b-a-l-l ya'll. 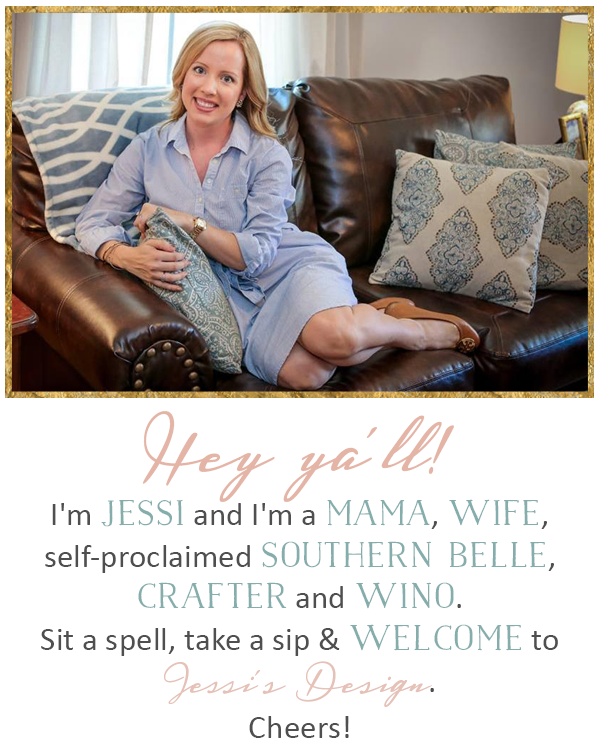 In the South, it's a way of life. College football is oh so popular but because I went to an all women's college, I didn't have a team to root for. With that said, I'm an NFL girl through and through and an optimisitic one at that....why you might ask? Oh you know, because I'm a die hard Skins fan and I have to make myself believe in them EVERY year.... I know, hush. This year will be their year (I can feel it - sort of...) GO SKINS! Also, as a little tid bit trivia: did you know my hubs is a Dallas Cowboys fan? None of us in the family know how that happened but it does make for very intense gamedays! 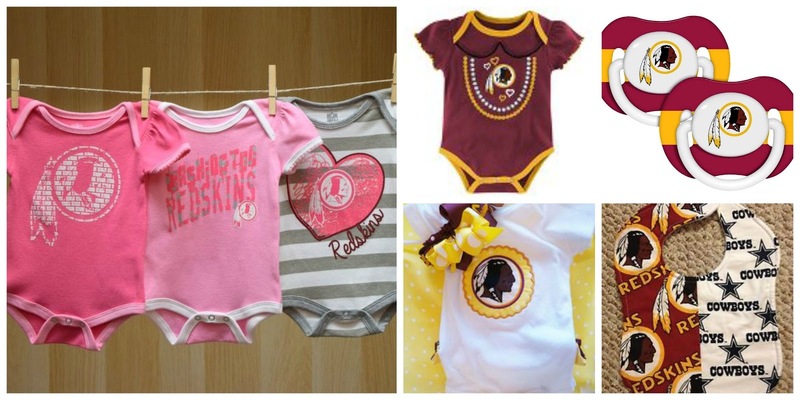 Today I wanted to share some new Redskins gear I plan to get little Miss A (without telling her father of course) Notice the two sided bib with both Dallas and Washington! (haha) Also, I'm sharing one of my go-to tailgate recipes. Not too much longer until pre-season! Linking up today with Erin from lovefunandfootball for Tailgate Tuesday! I'm so glad you linked up!!!! 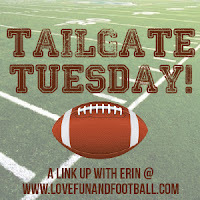 :) I love finding other football loving bloggers, especially the ones who love the NFL!!! :) Those baby outfits are just too cute- I hope you get 'em all! I don't know what I love more - football or the game day food! 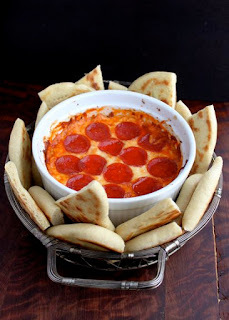 YUM to that pizza dip!! What cute little clothes!! That will be so fun to dress her up! How adorable are those onesies! And that dip! YUM! The pizza dip looks great!! I need to do this linkup! That pizza layer dip looks amazing! I don't have a pro football affiliation (because I wouldn't want to deal with the heartache of being a Cowboys fan. haha), but I am kinda a Skins fan because I am a Robert Griffin III fan! I actually went to college with him. :) (My "claim to fame" is that he asked me out a few times! Haha). I love the two-sided bib! Did that have it for any combo of teams?? We are a house divided as well so it would be fun to get one when that time comes for us! House divided over here too! I'm a cowboy fan and hubby Is a bills fan .. I think it makes things fun! Those are cute outfits. I say go get them!! Thanks for sharing the recipe. It looks so tasty. I can't wait for the season to start. YAY for the Skins gear for Andi--she will be the cutest little Redskin there ever was!! The two sided bib is a good compromise...gotta support both sides (begrudgingly lol). And gimme all the pizza dip!!! !